Savvy Rest is a mattress manufacturer who's mission is ... "To manufacture the finest nontoxic, comfortable, and durable alternative to conventional mattresses". These mattresses are made of natural Dunlop or Taladay, with durable casings of certified organic wool and certified organic cotton. Not only do they make mattresses of top quality, but Savvy Rest also makes crib mattresses, organic toppers, organic bedding, organic pillows, organic pet beds, simple fit mattresses, natural platform beds and foundations. What a great idea ... natural mattresses! Savvy Rest was kind enough to send me the Organic Shredded Latex Pillow to review. The Shredded Latex Pillow contains soft, shredded latex (blended Dunlop and Taladay). 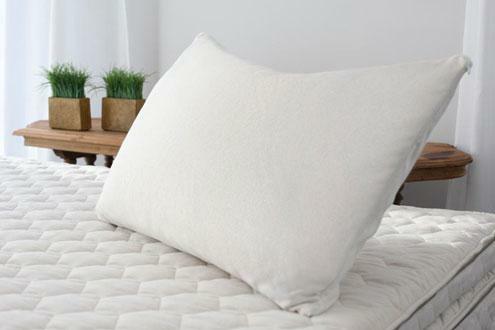 This pillow "conforms to your neck and shoulders for secure yet moveable support. It comes intentionally overstuffed so you can make your own perfect, personal fit. Just unzip the inner and outer casings and remove any amount of fill to create just-right height and density." The approximate height is 4-8"
Where can you purchase these fine products from Savvy Rest you ask? Well, you can order ONLINE, BY PHONE at 1-866-856-4044 or find the DEALER nearest you HERE. Savvy Rest has also kindly offered a Mommy's Moments reader a chance to win one of their Organic Pillows ~ You can enter via Rafflecopter entries HERE. Savvy Rest provided me with the above item to review free of charge, but this has not influenced my review or opinion. Thanks for sharing this review. Your creation are too good qualitative. Your mattress and pillow is giving the fantastic sleep. It is first choice of the most peoples. That is important of essential sleep for quality.